Sony has said it will stop making floppy disks, after nearly three decades of manufacture. Yet millions of them are still being bought every year. The floppy disk is the original symbol of storage; when you want to save a file, you go looking for that little icon that looks like a floppy. 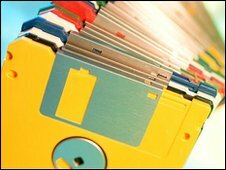 Every year another computer manufacturer stops putting floppy drives in its machines, or a retailer stops selling the disks. Each time the cry goes up that the death knell has been sounded for the floppy disk. However, Verbatim, a UK manufacturer which makes more than a quarter of the floppies sold in the UK, says it sells hundreds of thousands of them a month. It sells millions more in Europe. "We've been discussing the death of the floppy for 14 years, ever since CD technology first started coming on strong," says Verbatim spokesman Kevin Jefcoate. Yet what was Sony's best-selling peripheral for its computers in recent years? The 3.5-inch floppy disk drive that connects via a USB cable. Somewhere out there, the floppy disk is alive and well. But where? The truth is the 3½-inch, 1.44 megabyte floppy - the disk that made it big - has always defied logic. It's not floppy for a start. The term was a hangover from its precursor, the 5¼-inch floppy, which had a definite lack of rigidness about it. However, its smaller successor held 15 times as much data. But then along came the CD-ROM, and then the USB flash drive shamed them both; the most voluminous USB stick - which could pass for a keyring - can now hold nearly 90,000 floppies' worth of data. One might be tempted to think that, like the vinyl enthusiasts who insist music sounds "warmer" on a record, the floppy has its own fan club. But unlike the case of vinyl, a digital format of a floppy is no different than that found on your hard drive or USB stick. Given their limited size and speed of data transfer, along with their increasing obsolescence, it's harder to find a floppy fan club than it is to find a laptop with a floppy drive built in. Anja Ffrench of Computer Aid International - the largest charity working to distribute recycled IT to Africa and South America - says that they only deal in computers from 2002 and later, meaning that they'll have the USB connection that obviates the need for floppies. The vast desks that control the light shows and sounds settings in theatres or music venues have until recently come with floppy drives as standard; the English National Opera is just one example of an organisation that uses them. A volunteer at the National Museum of Computing says that many scientific instruments - so-called dataloggers, oscilloscopes and the like - record their data onto floppies. This kind of expensive equipment is made to last, to be bought infrequently - and these gadgets may call for at least a few floppies in their lifetimes. But these relatively niche uses couldn't possibly account for the number of floppies - something like a million a month - that are being consumed in the UK alone. The answer may simply be that there are a great many old computers that read only floppies, and a great many computer users that have no need for the storage media that have supplanted them in other quarters. Rather than there being one industry propped up on the values of a floppy, or a horde of enthusiasts buying up the world's supply, they may simply be as much as many computer users need. "Old habits die hard, I guess," said John Delaney, research director for IT analysts IDC. "If you've been using PCs for a long time and you don't do much in the way of photography or music with them, then why would you change? "There are people who ride technology for as long as it can be ridden without falling over."